Better Insulation Can Help Prevent Climate Catastrophe. A new study highlights the contribution better insulation can make to slowing the effects of global warming. ADF magazine takes a look. According to a recent study by the Intergovernmental Panel on Climate Change , without urgent worldwide action to prevent global temperatures rising to a point 1.5 degrees higher than those of pre-industrial times, we face what they describe as a “Global Climate Catastrophe”. Whether you are a global warming sceptic or not, the three-year study paints a bleak picture of our future, if urgent action to reduce carbon emissions – one of the principal causes of worldwide temperatures rises – is not taken soon. The IPCC report, presented in South Korea in October 2018, says that rapid and significant changes need to be made across the board in energy consumption, land use, industry, cities and lifestyle. It says we need to travel less, use energy more efficiently and demand low carbon in everyday consumer products. The report also emphasises the need to improve levels of insulation in homes, offices and factories so as not to waste the energy that has already used precious resources to generate. Clearly, the main action points are aimed at governmental levels but even small steps taken by individuals can collectively, make a significant impact on the issues that threaten us. Take home insulation. Over 60% of our current housing stock was built pre-1960 when little thought was given to heat loss prevention. The incorporation of insulation in new-build properties only really began in the years following the oil-price shock of 1973. Now, with energy prices rising year by year at inflation busting rates, efficient thermal insulation is more important than ever before. 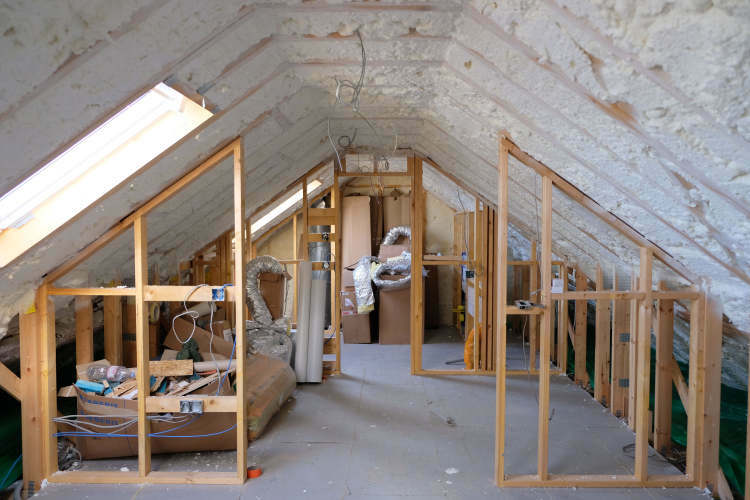 Unfortunately, there is a common misconception that, to reduce heat loss in a building you simply put more and more insulation in the roof. This works up to a point, beyond which, adding more layers of insulation follows the law of diminishing returns. Why is this? To understand how insulation works it helps to understand heat flow, which involves three basic mechanisms — conduction, convection, and radiation. Insulation materials work by slowing conductive heat flow and to a lesser extent, convective heat flow. Heat flows from warmer to cooler areas until there is no longer a temperature difference. Heat loss is also proportional to the speed of the moving air, the amount of moisture present and the temperature differential between heat source and the air itself. 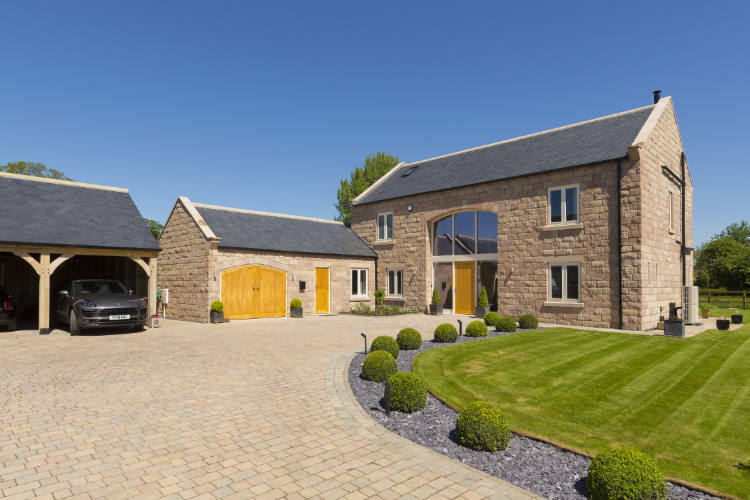 In a typical home, this means that in winter, heat flows directly from all heated living spaces to adjacent unheated roof voids, garages, cellars and particularly to the outdoors. In order to specify insulation correctly, the designer needs to understand the reasons why it works and apply the correct technology to any given construction detail. By understanding the processes that make insulation work and indeed, the factors that stop it from working, design professionals will be in a far stronger position to specify the correct material for the correct application. In the UK, U values are the measure of insulation’s ability to limit conductive heat flow – the lower the U value the better the resistance to heat loss. However, it should be noted that up to 40% of a building’s heat loss can be attributed to air leakage – what we would all understand as draughts. Moisture vapour in the air within a building carries heat and moist humid air can support up to 4000 times more heat energy than dry air. As air leaks out of a building it carries this moisture vapour and with it, heat. Therefore, the best way to increase the energy efficiency of a building is not merely to reduce U values as required by Building Regs, but rather to combine U value reduction with an air barrier – creating a “sealed box” effect to reduce air leakage to a minimum. Traditional forms of insulation – mineral fibre and rigid-board type materials – are relatively inefficient in sealing the box, in that they cannot completely fill all voids or seal the interface between the insulation and the building structure. Nor can they cope with small structural movements which will often lead to air-leakage gaps, particularly in difficult to treat situations where access is poor and/or when voids are of complex geometry. This can lead to cold bridging and thermal by-pass, with the consequent risk of localised condensation and inevitable dampness. Air leakage can be eliminated by the introduction of an air barrier but must be installed with great care if it is to perform as desired. 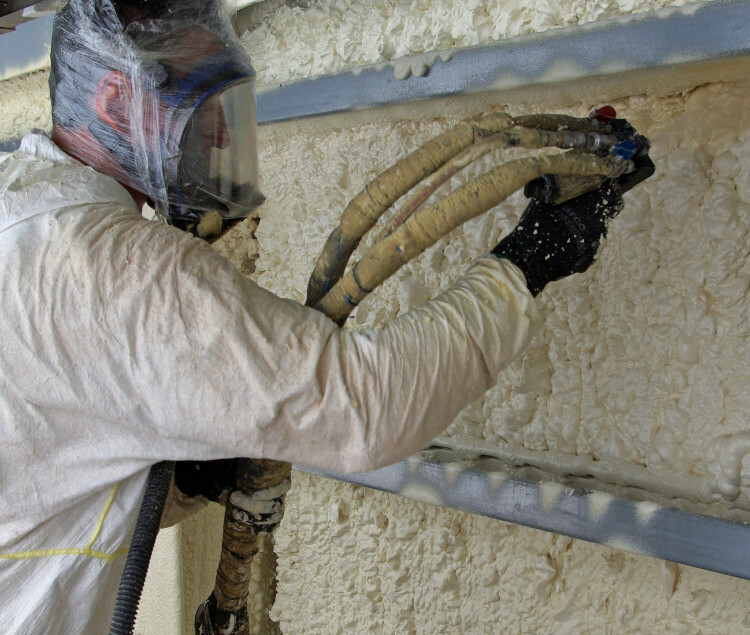 The modern alternative is a fully breathable, open-cell spray foam insulation, which is applied using a pressurised gun system. Here, foams are applied as a two-component mixture that come together at the tip of a gun forming a foam that expands 100-fold within seconds of application, sealing all gaps, service holes and hard to reach spaces, virtually eliminating cold bridging and air leakage. 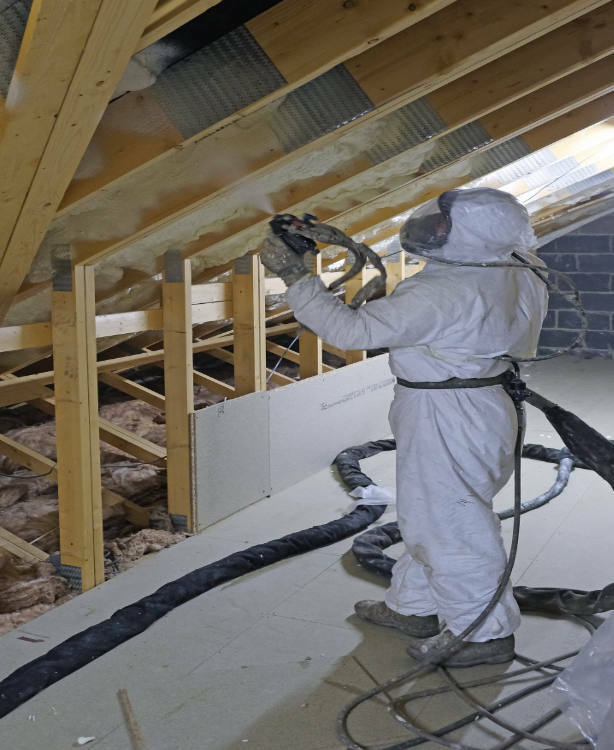 When selecting spray applied insulation it is important to understand a number of factors: Unlike the urethane foams of 20 years ago, modern spray foams such as Icynene FoamLite use water as the blowing agent. This means that the reaction between the two components produces C02 which causes the foam to expand. As FoamLite expands, the cells of the foam burst and the CO2 is replaced by air. Consequently, from an environmental perspective, Icynene has a Global Warming Potential of 1 and an Ozone Depletion Potential of 0 . Nor does Icynene emit and harmful gases once cured. 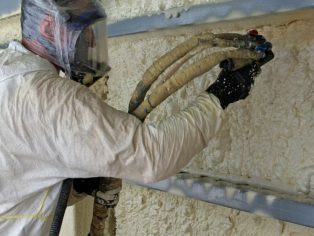 Modern spray foam systems are also formulated to create an “open cell” composition. Open cell foams such as FoamLite are extremely vapour open and will allow moisture vapour to pass freely through it allowing the building to breathe naturally. Open cell foam will also not soak up or “wick” water. This new generation of spray applied insulation products, when professionally applied by experienced contractors, can result in near zero air leakage through the building envelope. In fact, Icynene has been shown to achieve air tightness standards exceeding those of the world renown Passivhaus system of construction. Clearly, reducing heat loss in our building stock will make a significant contribution to lowering carbon emissions. 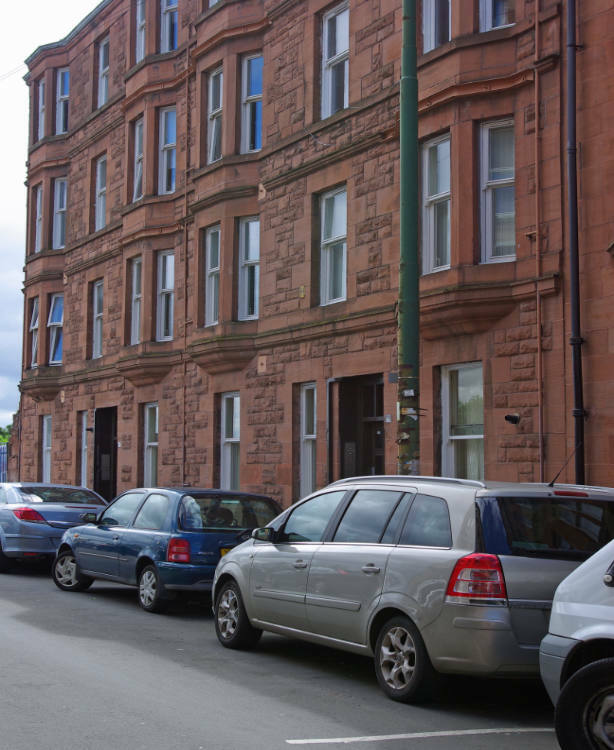 There are over 20 million homes in the UK, so improving their thermal efficiency through better insulation and reduction of air leakage will result in lower energy consumption and therefore help achieve the overarching goal of slowing the rise of global temperatures.